As you read in my last post, I have become a true believer in Young Living Essential Oils. Tonight I am telling you about their Lemon oil and the wonders it has done for me. You see, during the summer months while playing sand volleyball I got a plantar's wart (a wart on the bottom of the foot). Plantar's warts, like all warts are caused by HPV (Human Papillomavirus) and I'm sure I contracted it from the sand where we play barefoot volleyball. It's a little gross I know, but it's really not a huge deal. It's the same a getting a canker sore in your mouth. The worst things about a plantar's wart is 1. The pain they cause and 2. How hard they are to get rid of. So, they are the same thing as a wart you would get on your hand, but due to the pressure of standing on your feet all the time a plantar's wart grows in, instead of out. They look like a hole in the bottom of your foot, as apposed to a bump. I am a runner. I have 3 young kids and NEVER sit down. I suffered with a plantar's wart for 6 months! It was terrible! After my amazing results with Young Living's Peppermint Oil treating my head aches I decided to see if there is an oil that could help my foot feel better. And you guessed it. 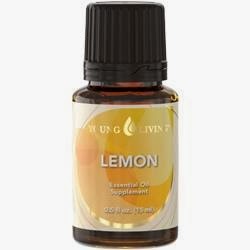 Young Living's Lemon Oil is what I found. So, here's how it worked. I applied the lemon oil (undiluted) to the "hole" on the bottom of my foot once per day for two days. And you know what? The "hole" (aka plantar's wart) in my foot was almost completely gone! The lemon oil gets down in to the hole and attacks the virus causing the wart. And it KILLS it! After the first 2 days of treating my foot and having such amazing results I continued treating it until it was gone for good. 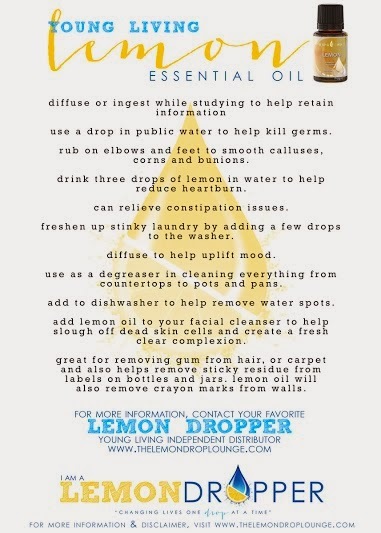 Young Living's Lemon Oil has been an amazing addition to our house. *And I've been rubbing it on my leg for a varicose vein (I so graciously received after my 3rd baby :( ) and shhh...I've been rubbing it on my upper thighs for cellulite, but let's pretend I never said that! Young Living's Lemon Essential Oil has endless possibilities! And as always, never substitute Young Living's Essential Oils with another brand. Ingredients, purity and quality differs with other oils. They could actually hurt, instead of help you. Did you cover up your planters wart after putting the oil on it? Just socks. The oils obsorb into the skin pretty quick. I would wait for the oil to absorb for walking on the floor or cover it with a sock to avoid getting oil on the floor. What a great essential oil. I would add 3 or 4 drops to my water during a bout with a virus and it would completely help my sinuses unclog. It is also very refreshing and uplifting to breathe the scent. There are some real Bozo's here. If you don't like what the owner of this pAGE HAS SAID THEN DON'T READ IT. I am trying the lemon oil on my grandson and hope it works. Going the dr. route does not sound fun. I am a firm believer in Young Living essential oils. Thanks for sharing.